In our busy lives and convenience-driven world, nutrition can sometimes take a back seat. Nutritionists all over North America are surprising people with their latest approach to healthy eating – snacking. Once considered the dieter’s bane, snacking is no longer the late-night, fridge-raid it used to be. Now, snacking has taken its rightful place in the healthy diet alongside the three main meals. However, we’re not talking about the crunchy, salty, coated in artificially-flavoured powder snacks. We’re talking about right-sized, fresh food snacks. Celebrity health experts like Harley Pasternak are touting the benefits of the 5 meals a day plan. This includes your standard breakfast, lunch and dinner but also two additional snacks between these meals. The idea here is that snacking keeps you from entering that ‘starve mode’ by continuously eating small meals. When you are satiated you are less likely to overeat or reach for those convenient (but too often bad for you) foods. Instead, you plan healthy snacks to keep you on track all day. 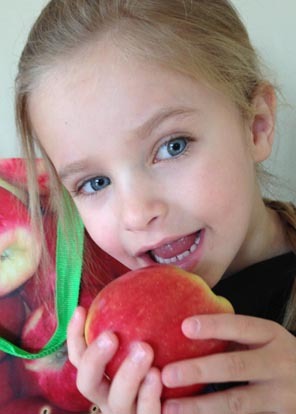 Ambrosia apples are perfect for this approach to nutrition. Most Ambrosia are about 100 calories. They are full of soluble fibre which helps us feel full and satisfied. Plus, the fructose offers a sustained increase in energy so we don’t experience a ‘sugar high’ or feel run down – which is the other time we tend to make bad food choices. The other great thing about adding Ambrosia apples to your snacking plan is that you can pre-cut your apples in the morning (Ambrosia are naturally slow to brown) and have them handy when that need to snack strikes. Add a slice of cheese or some natural peanut butter for protein and you’d have a Harley Pasternak approved snack on your hands. So, grab an Ambrosia and reclaim snack time in the name of health!